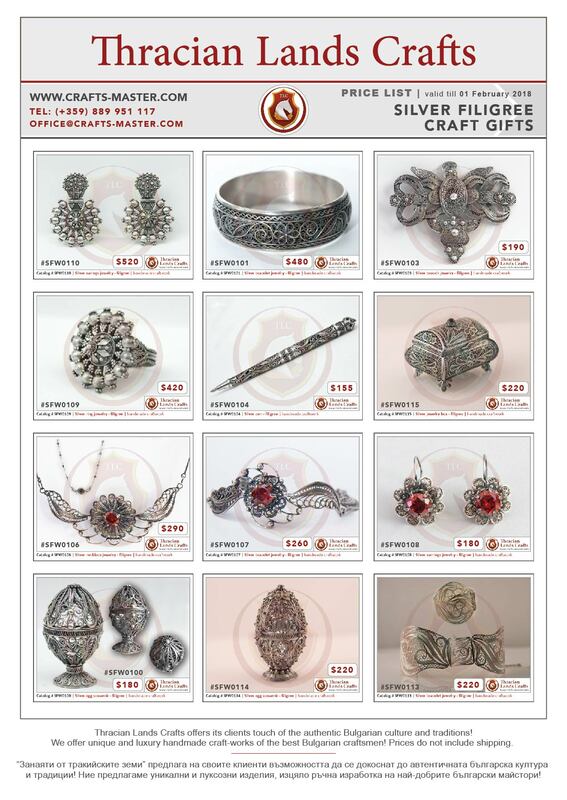 Our products are handmade in Bulgaria by the best Bulgarian craft-masters! Please note that shipping cost will be added to the initial selling price. 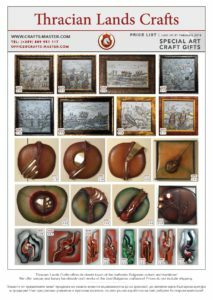 Scroll down to see our PRICE SHEETS at the bottom of the page. 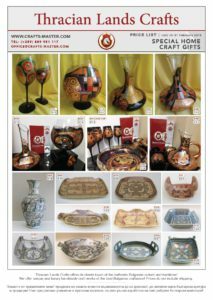 We promote and offer unique handmade craftworks of the best Bulgarian craftsmen! We offer our clients and partners touch of the authentic Bulgarian culture and traditions! Our exquisite products are recognized for their high quality, extremely fine detailing and precise work. 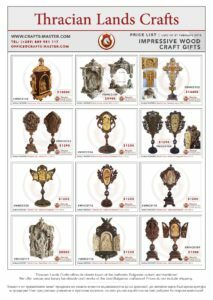 We know what it takes to create and deliver exquisite and meticulously handcrafted products, with high quality and uniqueness. 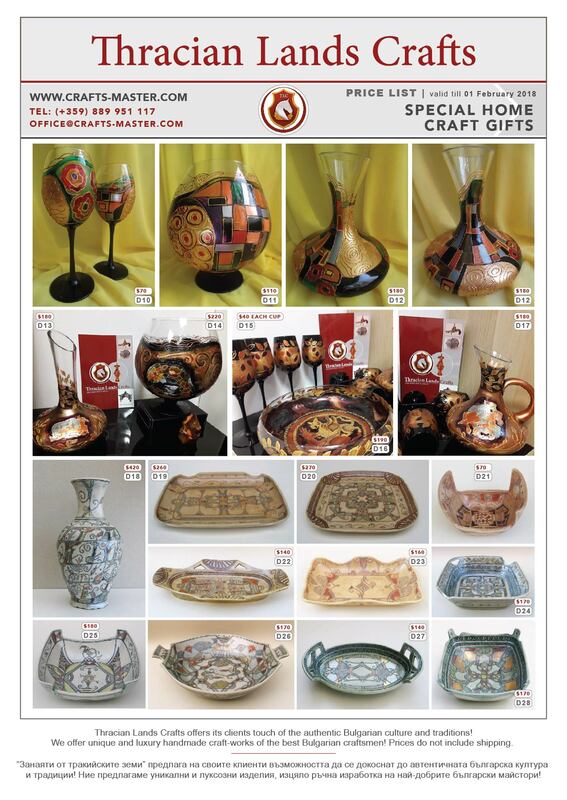 We combine the amazing skills of over 5000 Bulgarian craftsmen, all licensed masters in their specific field of crafts! The photos of our products are not able to depict their actual beauty and style, but even they are sufficient to impress our clients or visitors to our web site. 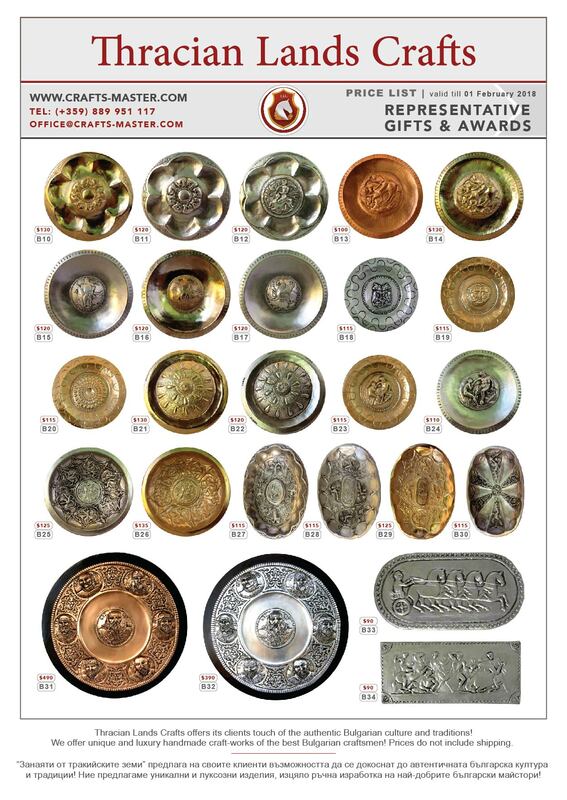 Most of our items can be additionally engraved, which means that we can give an extra individuality to your gift. 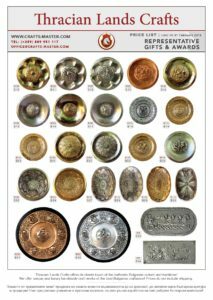 Our products are suitable for representative purposes for businesses, official protocol gifts, for all types of events and special occasions, for personal or official gifts, or for special collections. 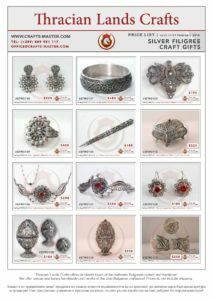 We also offer custom-made products with special requests. OUR PRICE LISTS HAVE CHANGED SINCE 01 FEBRUARY 2018! THE INDICATED PRICES IN US DOLLARS ($) ARE NOW IN EURO. The updated prices in Euro will be posted soon. Stay tune, or send us your inquiry for the current price. 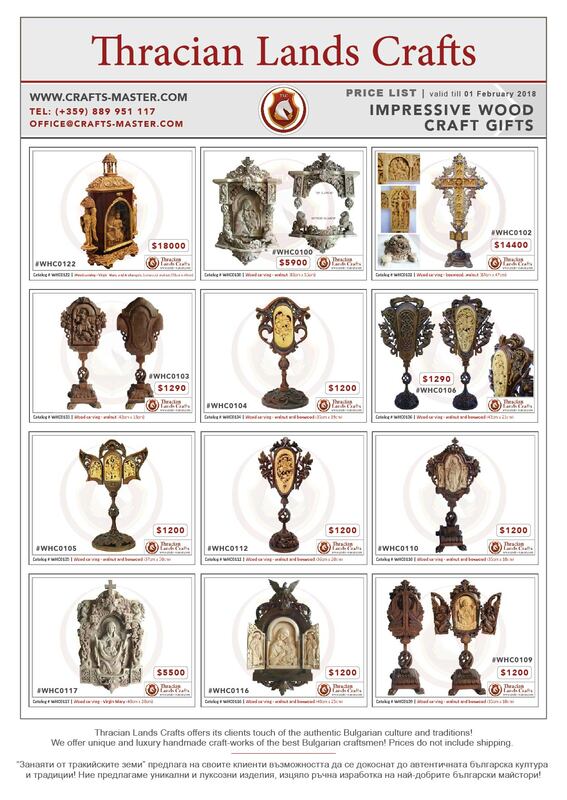 The price of every item is individual and entirely corresponding to the high-quality raw materials used for each product, and the hours of manual work of the craft masters, which are necessary to implement such a precise work, creating a real piece of art. Please note that shipping cost will be added to the initial selling price. We deliver worldwide. Please contact us for specific product details such as product material, size, certificates, or review our product information under “Products”. 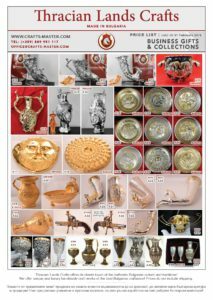 We invest the accumulated income back to more events, exhibitions promoting the Bulgarian traditions and historical heritage, and to support the Bulgarian crafts and culture. 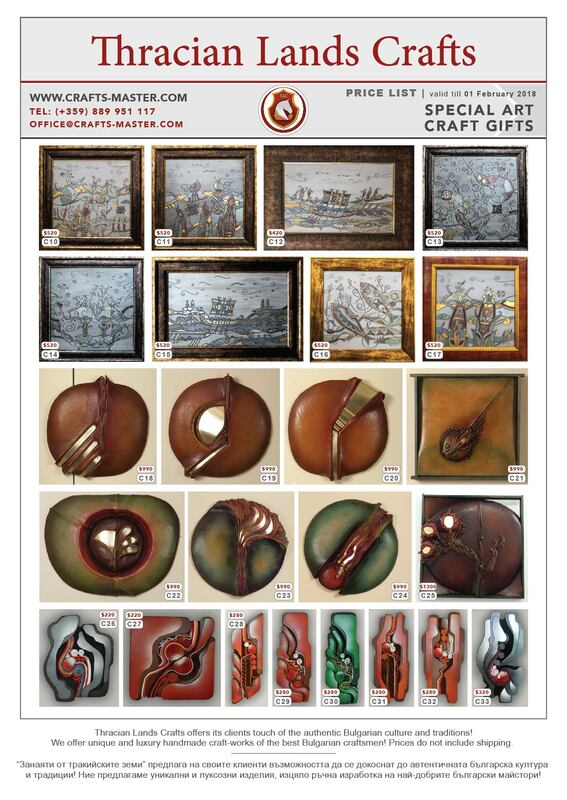 Therefore, your help by purchasing craft works from the best Bulgarian craft masters is important!